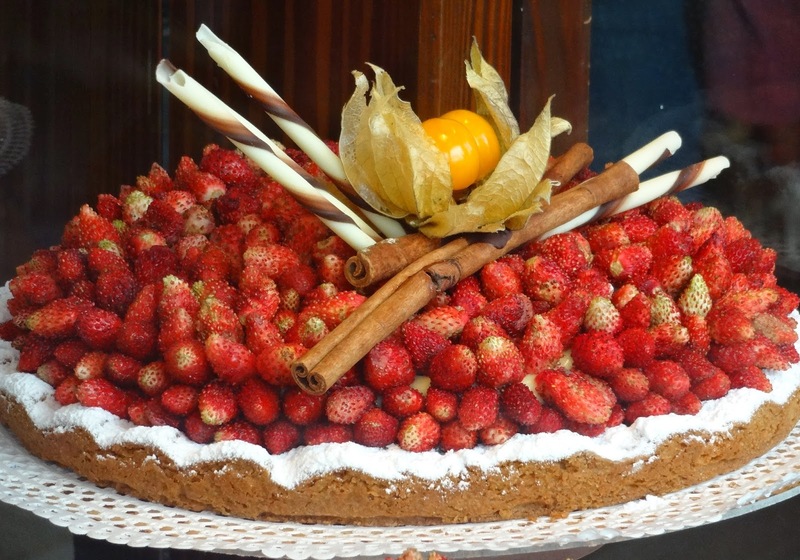 As I mentioned in my introduction to Ciao Gemma!, Fall was the season for holiday food preparation in my mother’s Italian family. Raviolis were the centerpiece. Through October and most of November we made hundreds of them. All rolled, stuffed, and closed by hand on a massive kitchen table. 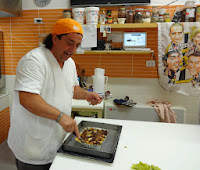 In 2013, I decided to deepen my childhood ravioli memories during a trip through Italy’s Emilia-Romagna region and registered to attend an official pasta making school in Bologna, the place even Italians recognize as the source of authentic Italian cuisine. 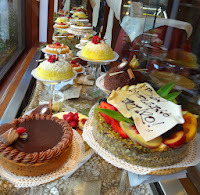 Cooking schools are an industry in Bologna and are plentiful since just offering lunch in a home kitchen could qualify. Visitors looking for particular experiences, especially with time and money constraints, should do as much research as their satisfaction level demands. Being on a limited budget, value was a significant part of my decision mix. But I also wanted to "live" the culture of an Italian kitchen. 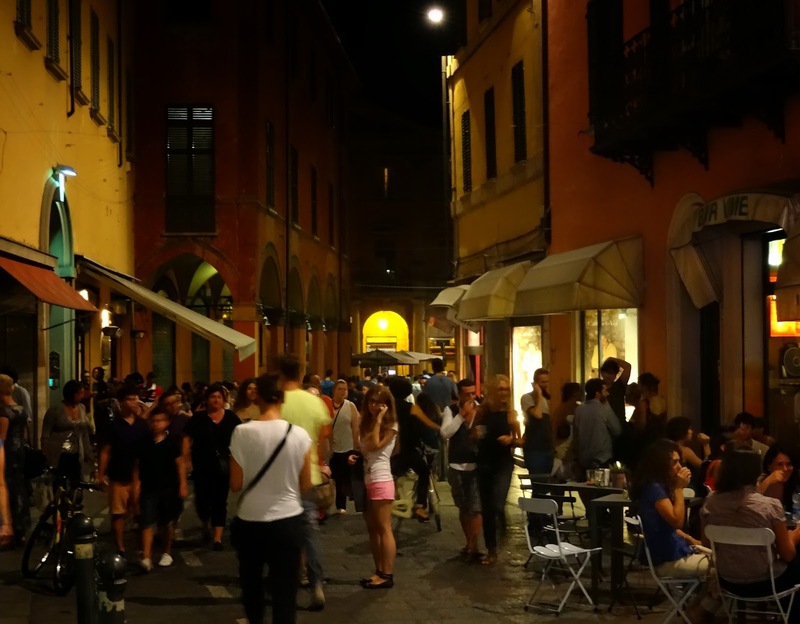 So I chose the Vecchia Scuola Bolognese primarily because of its very affordable five day immersion course, allowing me to spend an entire workweek absorbing the sights, sounds, and sensations I craved. Use guide books, magazines, and a variety of Web resources in your research. Pare down candidates using available reviews. Interact with reviewers whenever possible. Correspond directly with the schools by email or even by phone. This can assure you that the school is still operating, will give you a sense of their customer service standards, and help you to better understand important details such as payment options. Finally, as a general rule of travel, be open to making the best of whatever actually happens. I didn’t fully appreciate Vecchia Scuola Bolognese as a serious culinary production and training facility until I arrived. 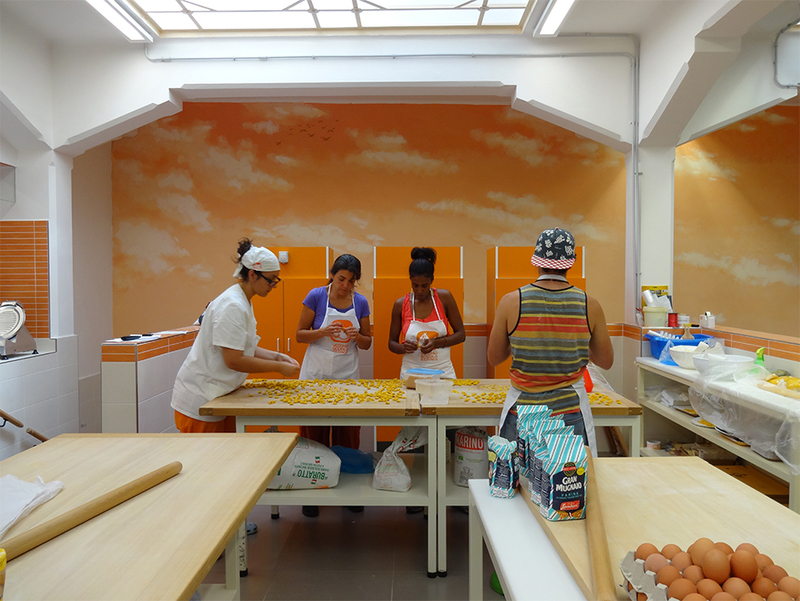 They do offer a casual half day tourist course with lunch included, but their primary students are those beginning or extending professional careers in Italian pasta and pastry making. The five day course I took is actually considered the first step toward earning the school's three month professional culinary certification. Vecchia Scuola is also an ongoing pasta production facility supplying food establishments throughout the region. 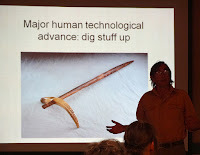 Students are expected to practice their skills creating usable product. Nothing is wasted. What may not be “beautiful” enough for sale to an outside client will certainly be used in the school's student staffed Trattoria. I paid for the class about six months before my trip. Arrangements such as available course times and dates were made through email in both Italian and English, using Google translate when necessary. Payment was sent and confirmed via an international wire transfer made through my bank. 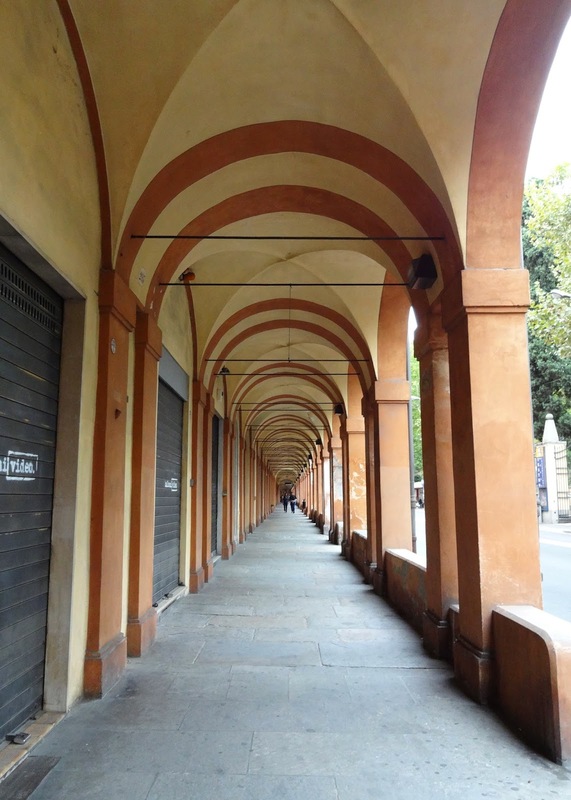 My hotel in Bologna, Albergo Rossini, was a short portico covered walk from the Vecchia Scuola. Class started at 9 AM and lasted about four to five hours. The only new students on the day I started were myself and a twenty-four year old Israeli pastry chef who had just completed a four month certification in gelato making. He was planning to open his own cafe on a beach in Tel Aviv. Alessandra Spisni (shown above in a screenshot from their website) is the unifying force of Vecchia Scuola. Though she was traveling outside of Bologna during the time I were there, signora Spisni was none the less a constant presence in the many attractive product displays throughout the school. Alessandra Spisni and her entire family are endowed with an insatiable appetite for life. The signora's brother, Alessandro, casually oversees the culinary school by correcting students with warnings lightly disguised as jokes. Much of his work day was spent enjoying food, family and friends. Fluent in four languages with a graduate degree in Cultural Anthropology, Carla led an ever changing group of students through various levels of instruction while managing overall production (rolling sheets of perfect pasta herself), quality control, and distribution for Vecchia Scuola. During a break, I asked Carla how she chose pasta making rather than pursuing a career in her degree. She told me that she came to Vecchia Scuola to do a cultural research project then discovered she both enjoyed the physical exercise of the work and had a natural talent for it. Signora Spisni offered her a job. Carla took it, still loves it, and sees no reason that will change. The Israeli pastry chef and I were given official aprons, assigned lockers, oriented to the work space, and began making pasta alongside more advanced students. We started with a batch of Filei Calabresi, a simple pasta made with just water and flour rolled by hand into a hollow tube that embraces any sauce. 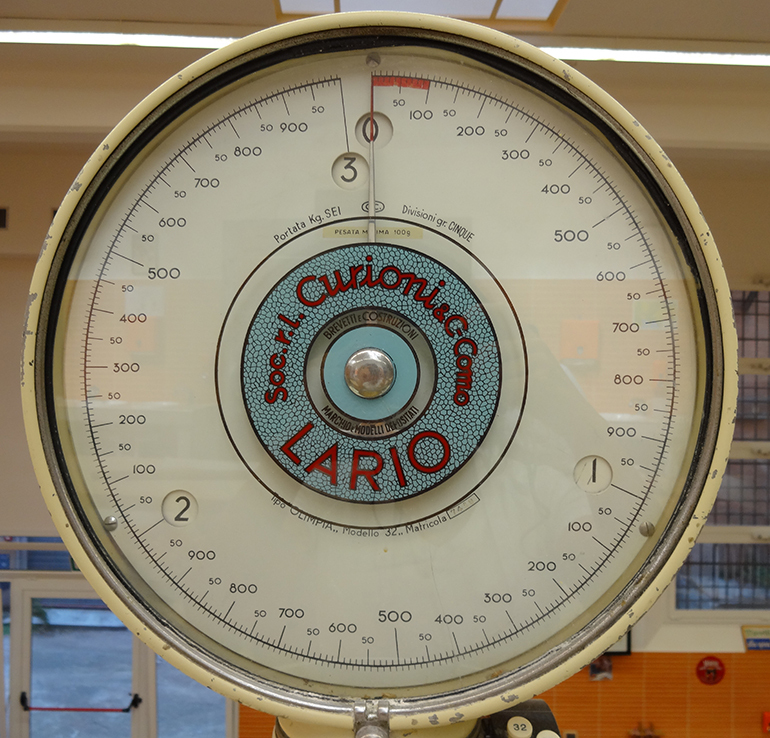 Using a classic industrial scale, we weighed rather than measured all ingredients. Weight, even for liquids, makes it easy to accurately increase or decrease the size of a recipe. We got a feel for how to properly knead dough and assess its readiness for rolling. The most exciting part of the process was using long wooden rolling pins or poles, called matterellos, to flatten the dough. In the video at the end of this post, Carla uses a matterello to roll a double volume of dough into a translucent gossamer sheet, closely resembling fine cloth, in less than five minutes. Both the matterello and table must be made of wood. Marble and stainless steel are too cold for pasta making. In contrast, wood warms the dough as it is worked and the grain imparts a surface texture that better holds sauces and condiments to the pasta. 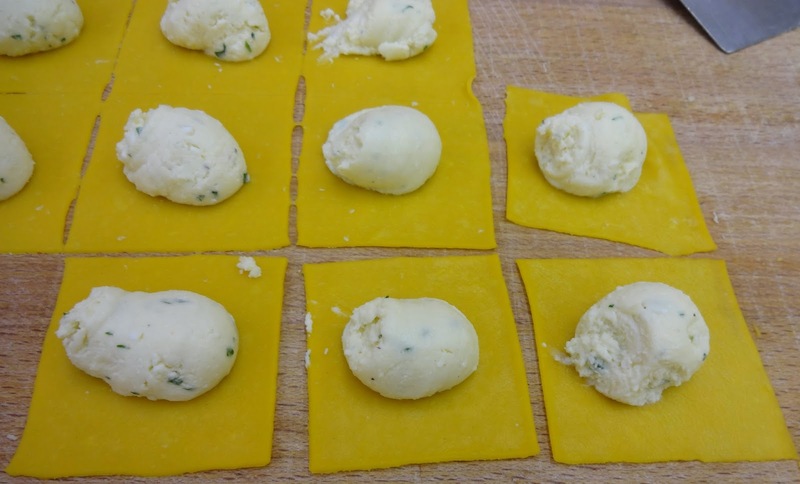 At the start of this post I mentioned that making ravioli was my reason for taking the class. And we did make one batch of ravioli at Vecchia Scuola. But what we produced every day in quantity was tortelloni, the much larger version of tortellini. 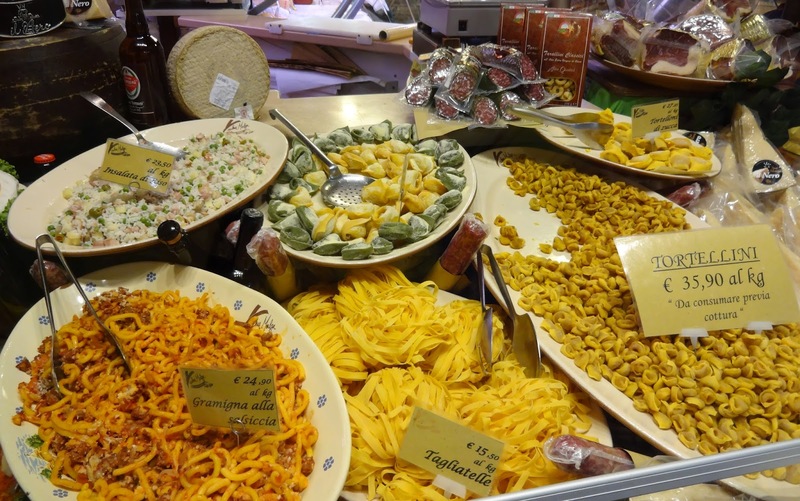 Bologna is known for its tortelloni, pasta with a big stuffed "belly" that brings to mind the city's Medieval nickname, "La Grassa" (The Fat). 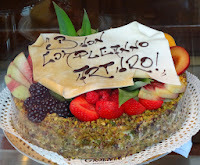 Of course tortelloni is much more popular than ravioli in Bologna! One fundamental variation between types of stuffed pasta is the thickness of the dough. 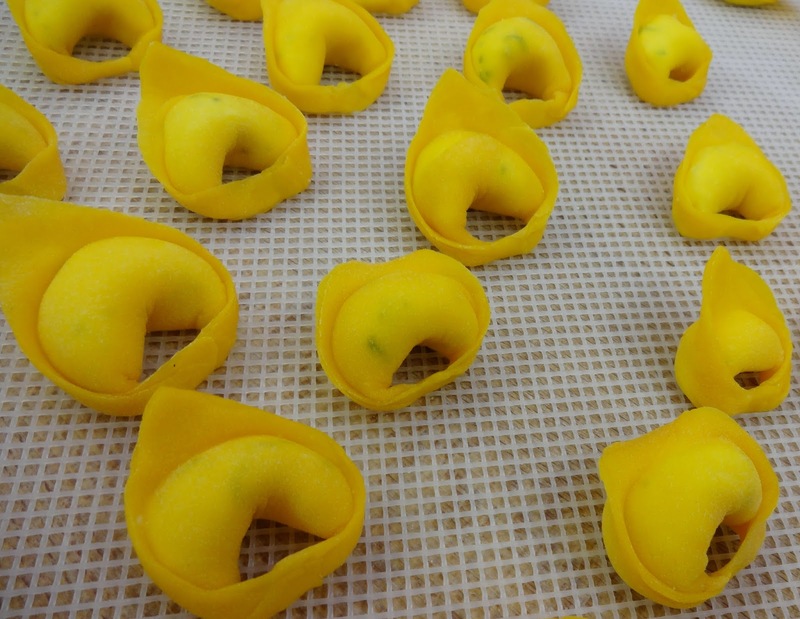 Tortelloni requires pasta that is as thin as possible because of its many layered folds. On the other hand, ravioli doesn't have any folds and needs to be slightly thicker to hold stuffing in place with just crimping around the edges. I may not have made many ravioli at Vecchia Scuola, but I did gain a deep reverence for the skill and talent of handcrafting this seemingly simple food. For those wanting to experiment for themselves, we used the basic recipe below for all variations of stuffed and flat pasta. A large wooden rolling pin can sufficiently flatten the dough but it's actually the length of the mattarello that makes it fun (and an art) to use. There are no handles on a mattarello. It moves with pressure applied from the palm of your hands, pushing and pulling like a massage as they move back and forth across the entire length of the pin. Yes. It is sensual. Lacking a real mattarello, a two inch diameter dowling, thirty-six inches long, sanded and bleached, will work. Have fun making pasta! Even the mistakes are edible. Ingredients are measured by weight so the recipe can easily be scaled for quantity. per 50 grams of liquid. Liquid can be water, egg, broth, or a cooked vegetable such as spinach or mushroom. 50 grams of cooked spinach = one egg. 50 grams of flour during kneading. To Mix Form the flour into a bowl shape on the table. Place liquids in the center of the flour. Gently blend flour into liquid. Knead until dough forms and stickiness is gone. Add flour as necessary. Wrap kneaded dough in plastic. Roll dough into a sheet carefully but quickly to avoid drying. Cut rolled sheet into one inch squares. Place a dollop of filling into the center of each square. Fold dough corner to corner into a triangle over the filling. Squeeze the bottom tips of the triangle together to form a tortelloni shape. Practice often and eat your work! Duncan Thomas, opened his presentation with this thought provoking exercise: "Instead of being concerned about limiting your caloric intake, imagine that your only available food source is what grows in the wild and must be gathered and prepared by hand." Dr. Thomas then illustrated this storyline with the unromantic reality of what it takes to forage a safe and nutritious meal. Bottom line: It is an arduous, daily undertaking that can be deadly without experienced knowledge but may also be the best hope of surviving a disaster. Wild plants can be deceivers or unexpected saviors so a healthy respect is in order. Examples! There are two nearly identical varieties of camas bulb. One will feed you carbs, the other is certain be your last meal. It's that poisonous. 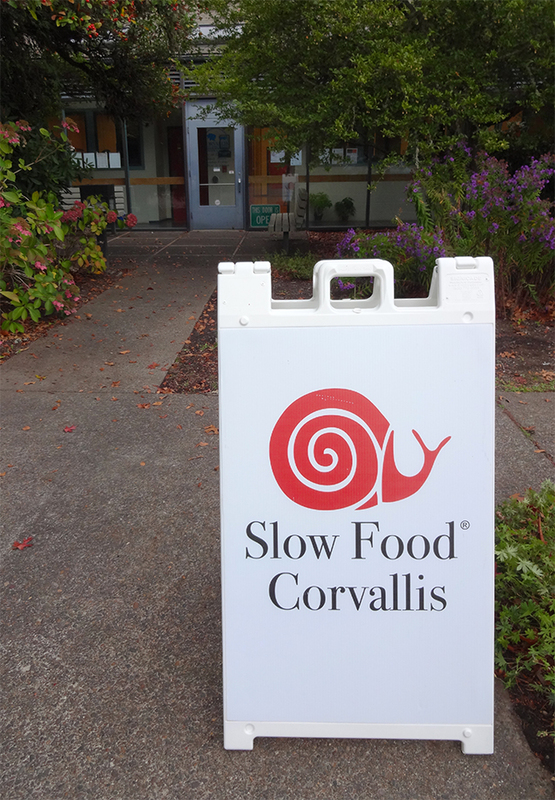 (Though even good camas warrants caution as the Lewis and Clark expedition learned first hand.) 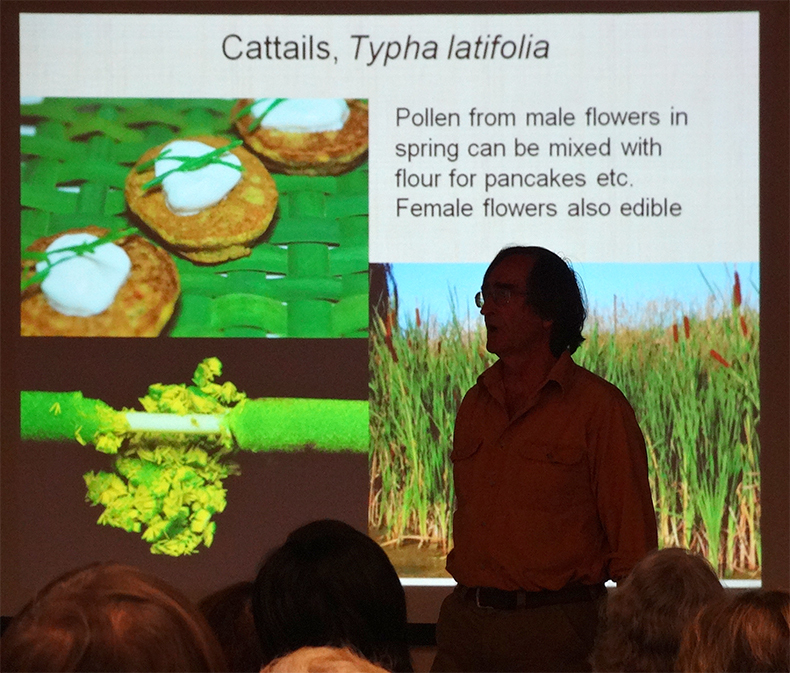 Then there is the surprisingly digestible cattail. Edible from shoot to flower and then some. Who knew? Native plants and animals are the very reason we survived as a species in the first place and can now indulge our cultivated taste for sugar, fat, and salt. So it's wise to get acquainted with the wild bunch. 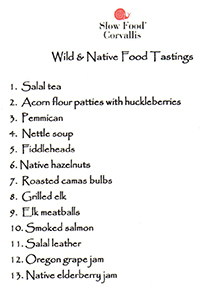 Culminating the event was a buffet of local hand harvested and crafted samples, most of which required many days of preparation. 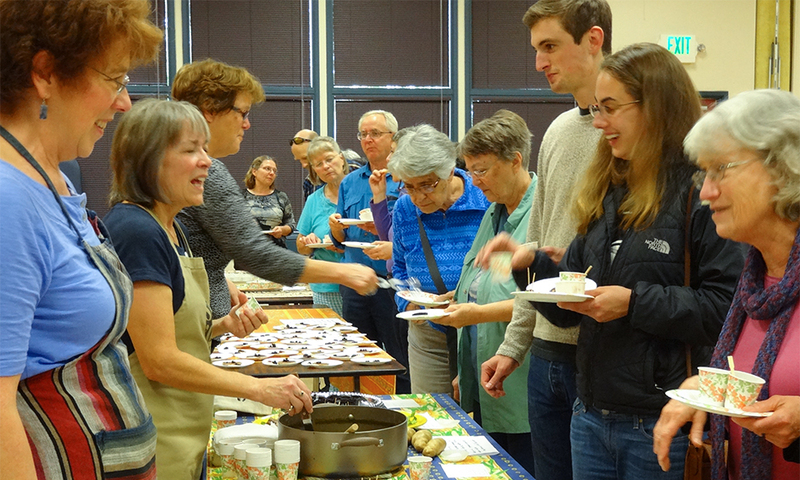 Frequent comments among the guests were about appreciating how easy our North American food requirements are in comparison. At the end of his presentation, Dr. Thomas divulged the results of a high-level research project his students conducted last year. 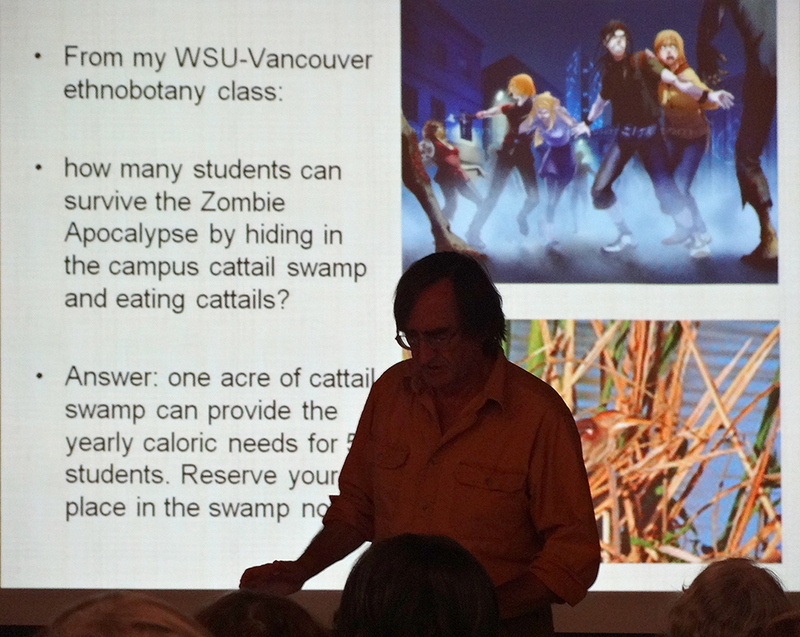 If you happen to find yourself near a cattail swamp during the Zombie Apocalypse, you are in luck. An acre of swamp will feed you and four others for a year. The students recommend reserving your spot in the swamp ASAP! 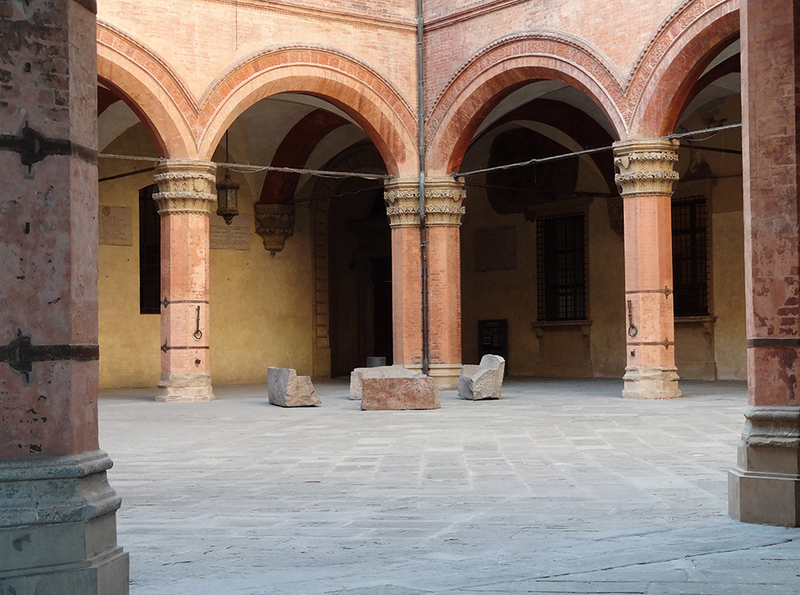 Bologna, Italy is home to the oldest university in the Western world and to a medieval architecture nominated for UNESCO World Heritage status. It also enjoys one of the youngest urban populations on Earth. Nearly a quarter of its inhabitants are students. 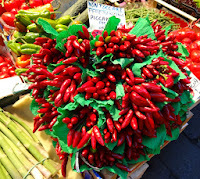 Over a 100,000 of them pulse through the heart of Bologna each day. It is an antique city vibrating with life. 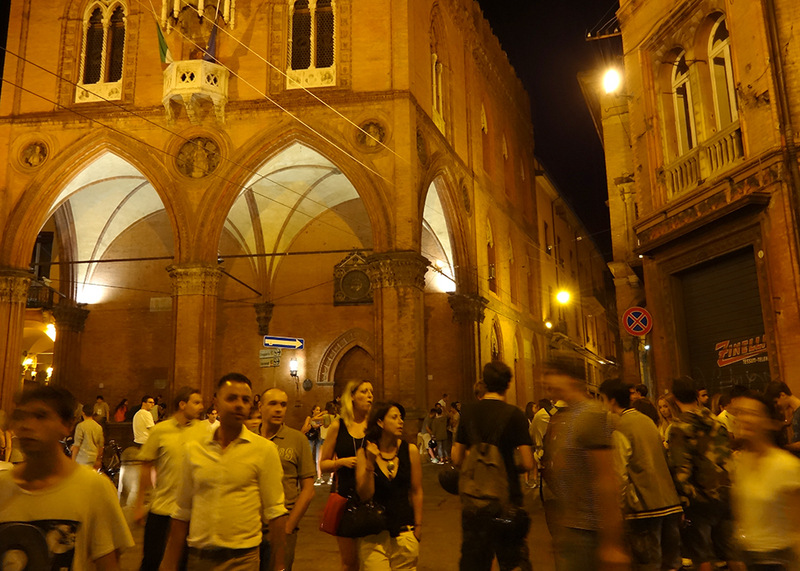 Unlike Southern Italian regions famously congested by cars, walking is the most popular mode of transport in Bologna. Forty kilometers (24 miles) of ancient porticos form a network of vaulted open air walkways throughout the city. 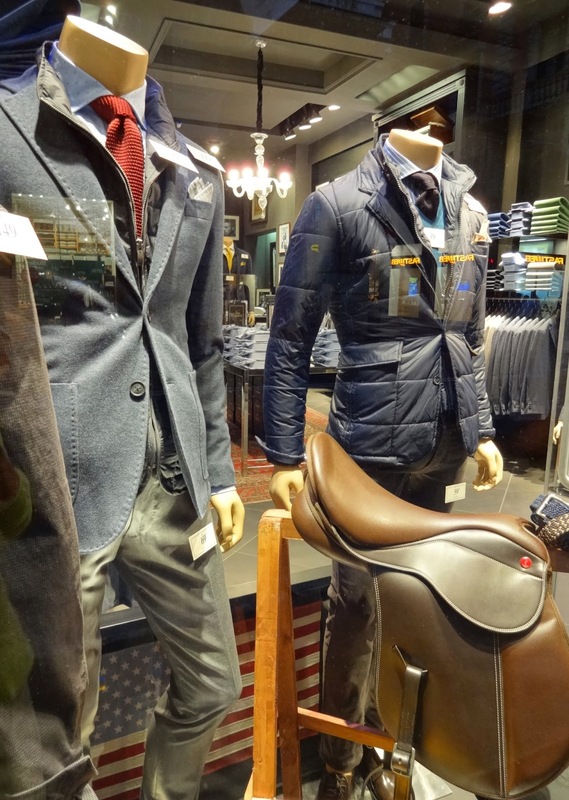 Casual meandering is a pleasure in hot summer sun or seasonal rain. Energy soars in the evening when even major routes are open to only foot traffic and bicycles. 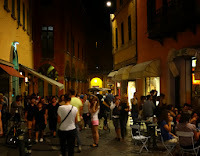 Well past midnight, crowded cafes spill into the streets. Waiters strut between tables, enjoying the atmosphere as much as their guests. There is an entirely human rhythm here, including periods of absolute silence when the city seems to rest along with its people. 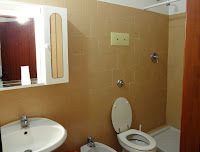 I stayed at the Albergo Rossini 1936 near the entrance to the University district and close to the Piazza Guiseppe Verdi which is a natural gathering place for students. 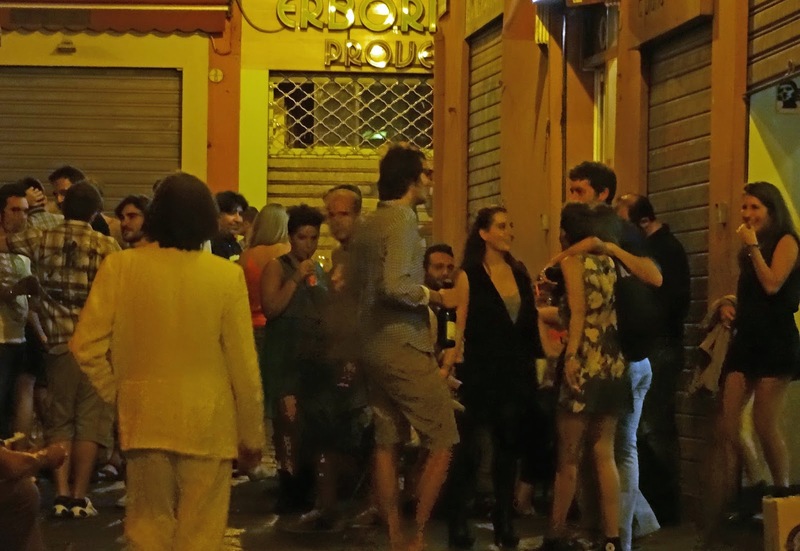 Though the street noise was louder than some would like, for me it was an opportunity to bathe in the (often dramatic) music of the Italian tongue. It is no wonder that Opera was founded in Italy. 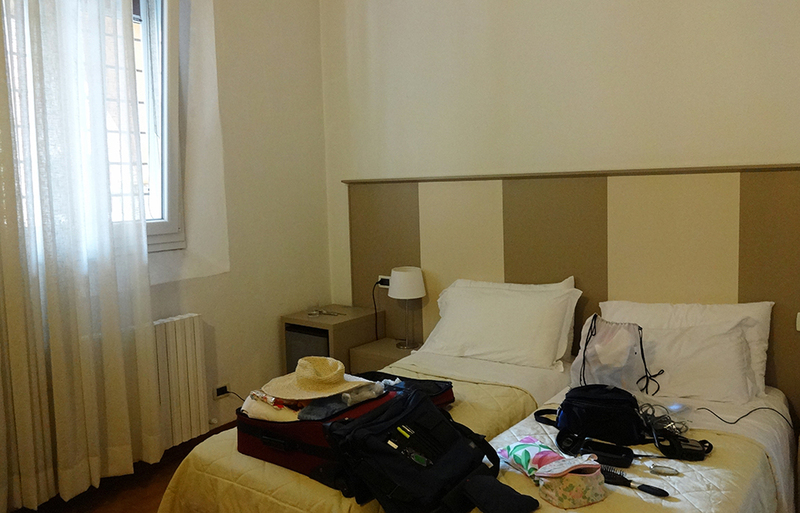 Rooms on upper floors of the hotel are quieter, facing an inside courtyard, but I chose to stay at street level. 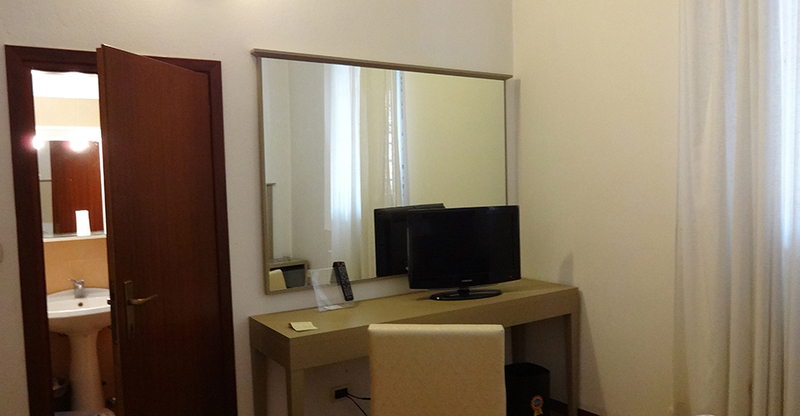 Albergo Rossini is located within walking Bologna's best known sites and its rates are a bargain. Staff are professional and charming. 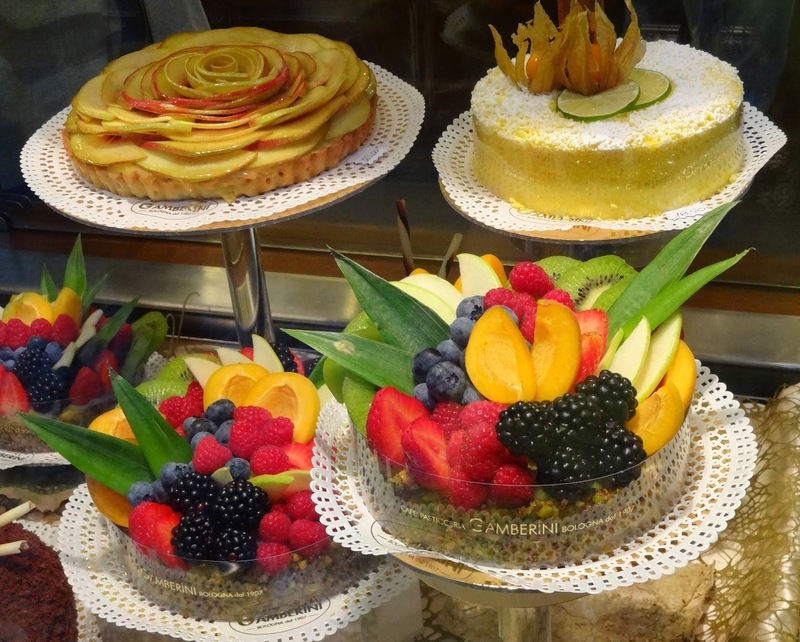 The included breakfast is plentiful, satisfying and served in an attractive dining room. I'll stay there again on my next visit. 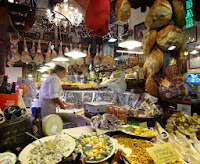 Bologna has three well deserved nicknames, La Dotta (The Erudite); La Rossa (The Red); and La Grassa (The Fat). 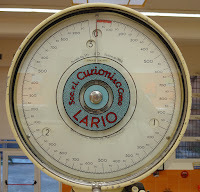 The origin of La Dotta is, of course, based on the University. 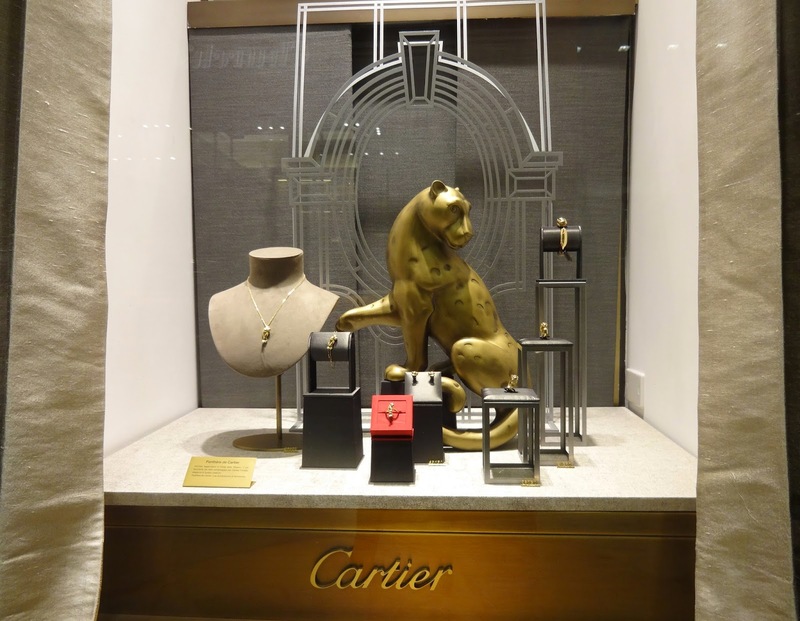 A long list of famous doers and thinkers have helped perpetuate the "La Dotta" moniker since 1088. La Rossa has a more disputed origin. The usual explanation is that Bologna earned this nickname from its predominance of red tile roofs. A more feasible origin, though, stems from its Communist political and economic affiliation which persists in some form even today. Though he was expelled from the party because of his homosexuality, the writer and director Pier Passolini was a native of Bologna and remained an avowed Communist until he was murdered in Rome at the age of 53. 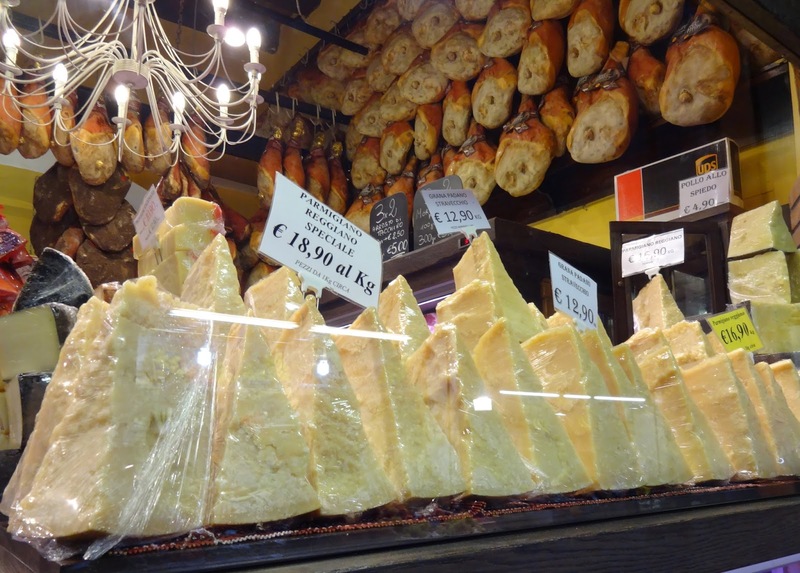 Of the three epithets, Bologna may be most proud of La Grassa. 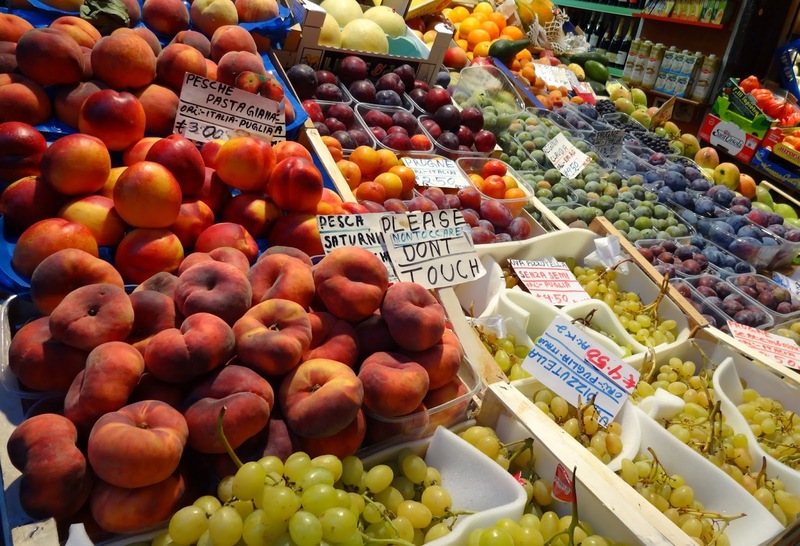 As Massimo Montanari, Professor of Medieval History at Bologna University, affirmed in his book, Food is Culture, body weight was an obvious indication of wealth before it became the consequence of a fast food world. 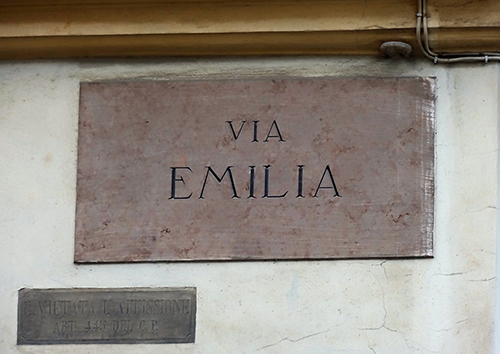 Bologna is the Capital of the Emilia-Romagna Province, a region of prominent "Comunes" originally connected by the Via Emilia, completed by the Romans in 187 BC. 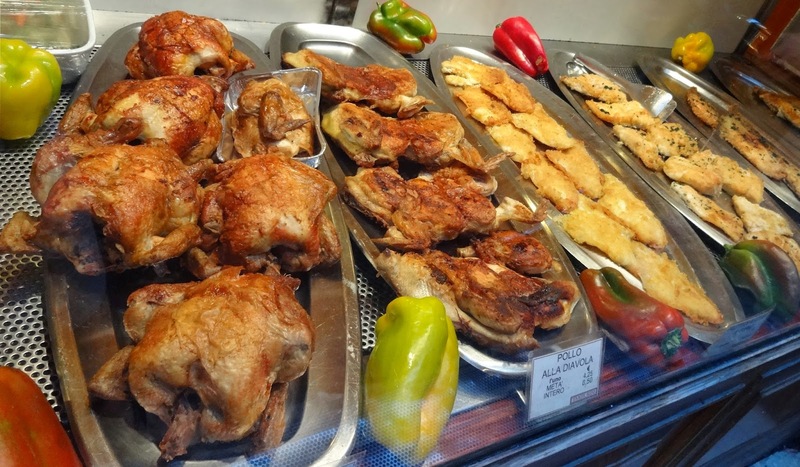 Even other Italians acknowledge the preeminence of Emilia-Romagna cuisine. 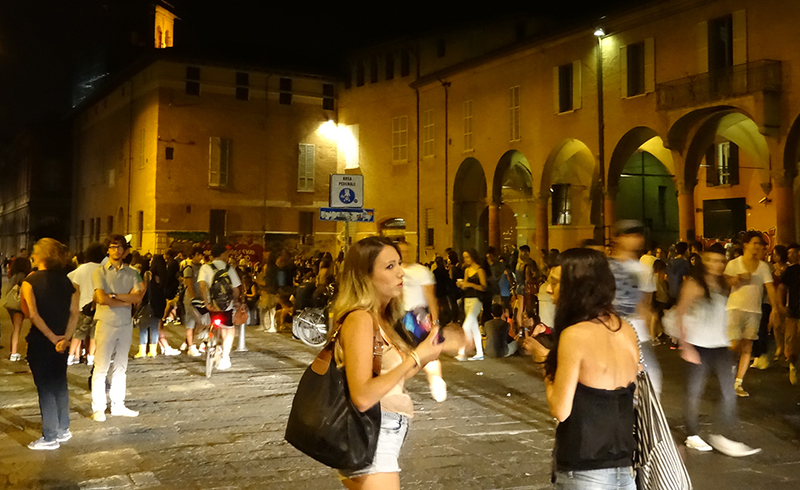 In upcoming posts, I will highlight some of the Province's best-known cities, Parma, Modena, Reggio-Emilia, and Rimi. There are options beyond imagination for food and wine tours of the region, though I took the plebeian route, using local trains. 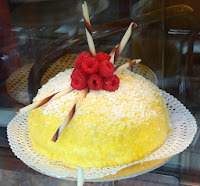 Because of its reputation, Emilia-Romagna is brimming with a wide range cooking schools, especially in Bologna. Careful research and clear personal objectives are in order for those who plan to attend one of these schools. The experience can vary from spending an afternoon preparing dinner in a family home to investing six months toward a certificate in restaurant management. My desire was to recapture a childhood feeling for preparing handmade ravioli. Starting with this Washington Post article, I chose to attend a week long pasta course at Vecchia Scuola Bolognese, a ten minute walk from Albergo Rossini. I will detail this adventure in my next post but, in short, it was an excellent way to immerse myself in authentic Italian culture. 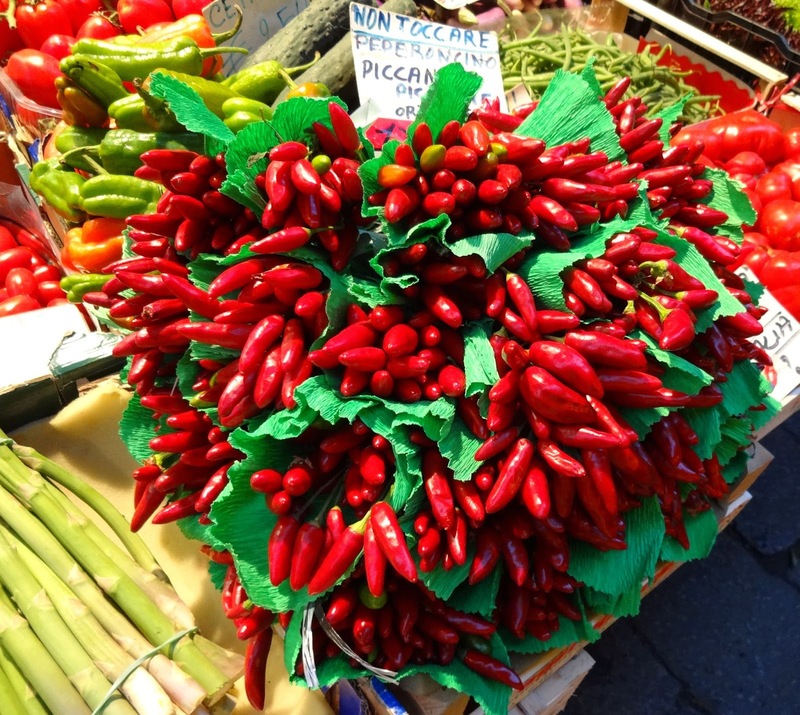 Emilia-Romagna is one the richest cultural treasures on Earth. Even a veteran traveler could be overwhelmed by the opportunities. The Bologna Welcome Tourist Office on the Piazza Maggiore is a great help in comparing, consolidating, and booking options, including travel. Italian train stations can be hectic so I appreciated working out schedules, pricing, and advanced ticket purchase with a gracious English speaking assistant at the Tourist Office. 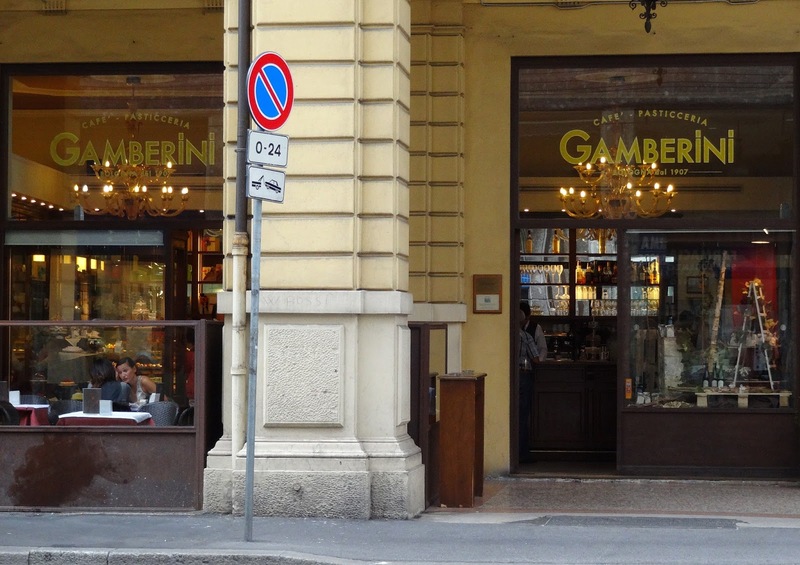 There are two cherished establishments that claim to be the oldest of their kind in Bologna, and both deserve top billing on any food lover's list, Tamburini - Antica Salsamentaria Bolognese and Gamberini Pasticceria. They are impeccable in every aspect. Their window displays alone may be enough to sate your hunger. 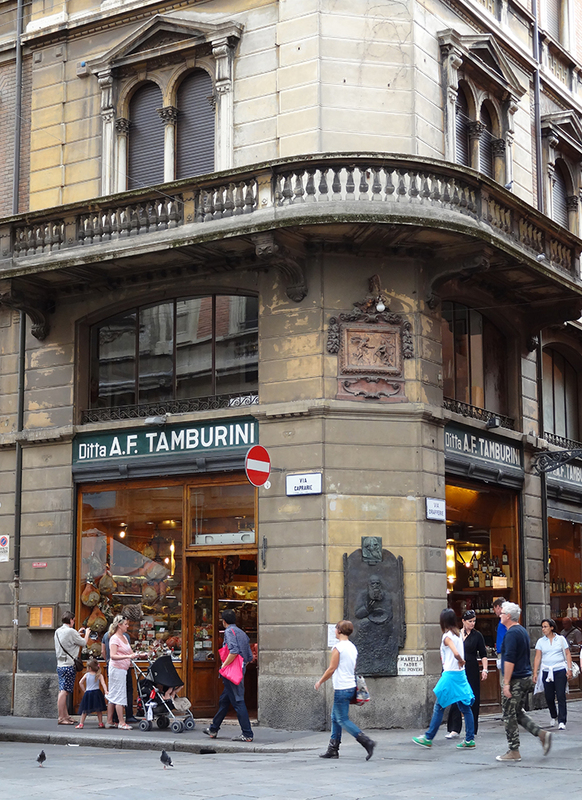 Often overshadowed by Milan, the Fashion District on Via Luigi Carlo Farini is another alluring aspect of Bologna. 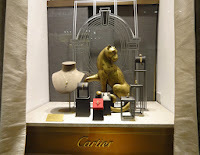 Exquisite window dressings are set in gleaming halls of inlaid marble, where all are welcome to glimpse the rarefied world of Prada, Gucci, Armani, and those other designers not lucky enough to be Italian. 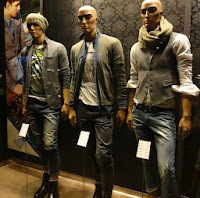 This was my second trip to Bologna. 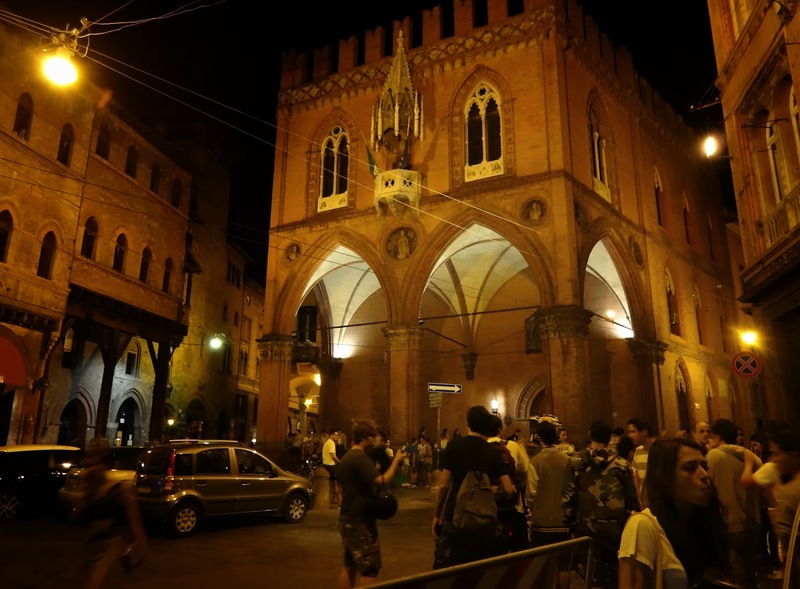 I first visited as a backpacker in 1977, three years before the deadly train station bombing, known as the Bologna Massacre, in 1980. This may explain my impression of underlying tension there then. I shortened my visit to only a few days and remembered little about it other than the Two Towers. So I arrived in Bologna this time with only modest expectation, planning to use it mainly as a base for exploration. Yet even after spending nearly a month there, I regretted having to leave. In fact, I now plan to return for regular extended periods. 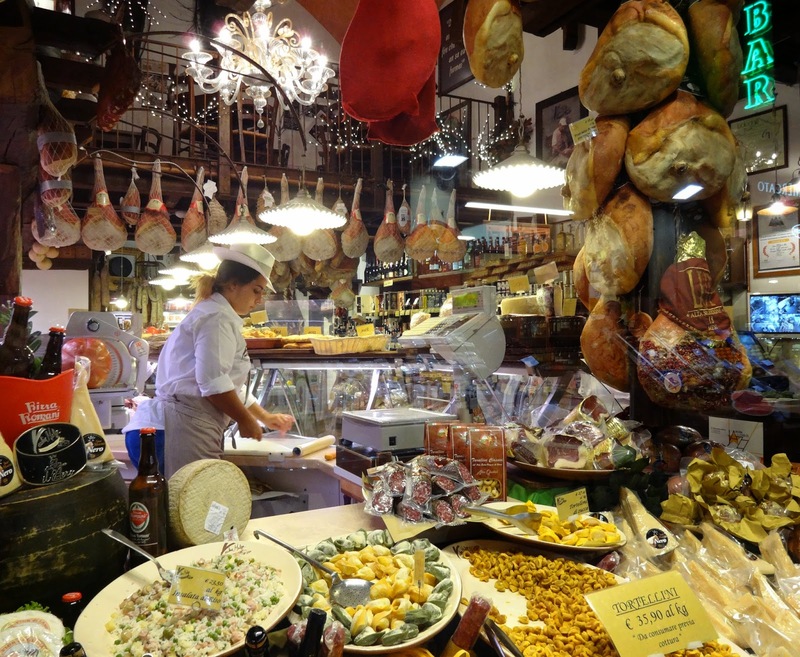 Bologna deserves to hold a patent on the formula for a good life. It already holds the recipe. And an unchallenged place in my heart. 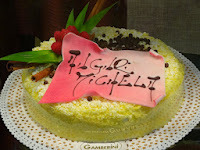 Ciao Gemma! 2018. Simple theme. Powered by Blogger.